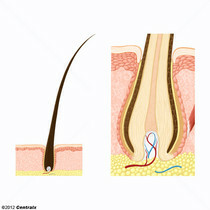 Small, sacculated organs found within the DERMIS. Each gland has a single duct that emerges from a cluster of oval alveoli. Each alveolus consists of a transparent BASEMENT MEMBRANE enclosing epithelial cells. 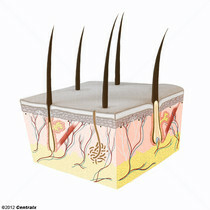 The ducts from most sebaceous glands open into a HAIR FOLLICLE, but some open on the general surface of the SKIN. 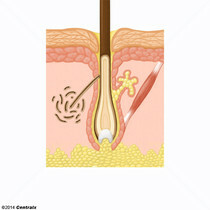 Sebaceous glands secrete SEBUM. Sweat-producing structures that are embedded in the DERMIS. 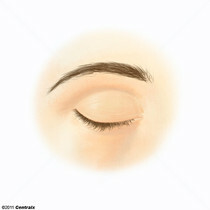 Each gland consists of a single tube, a coiled body, and a superficial duct. 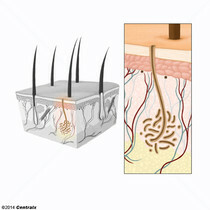 Large, branched, specialized sweat glands that empty into the upper portion of a HAIR FOLLICLE instead of directly onto the SKIN. 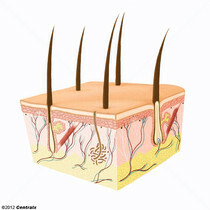 Simple sweat glands that secrete sweat directly onto the SKIN. 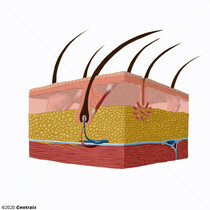 The outer covering of the body composed of the SKIN and the skin appendages, which are the HAIR, the NAILS; and the SEBACEOUS GLANDS and the SWEAT GLANDS and their ducts. The thin, horny plates that cover the dorsal surfaces of the distal phalanges of the fingers and toes of primates. 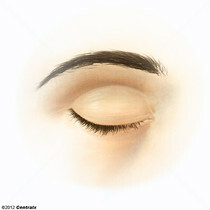 The outer covering of the body that protects it from the environment. 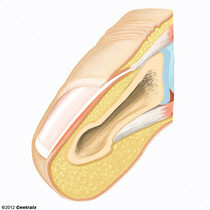 It is composed of the DERMIS and the EPIDERMIS. 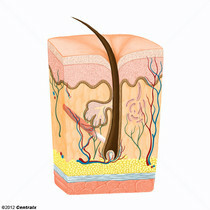 A layer of vascularized connective tissue underneath the EPIDERMIS. The surface of the dermis contains innervated papillae. 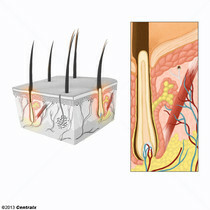 Embedded in or beneath the dermis are SWEAT GLANDS; HAIR FOLLICLES; and SEBACEOUS GLANDS.